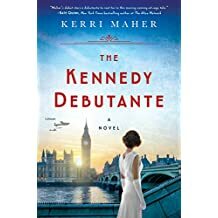 The Kennedy Debutante by Maher – Joyce's mystery and fiction book reviews with some non-fiction too! This novel is a richly imagined, evocative and detailed portrait of life in England, Europe and the U.S. in the years surrounding WW II. The book focuses on the Kennedys and their circle. Readers will spend time with staunchly Catholic parents, Joe and Rose, who have many aspirations for their children. Joe Jr. and JFK are portrayed as they fall in love and commit to service in the war. Rosemary and her emotional struggles are described and the younger Kennedy children also have a place. The book though is most especially the story of Kathleen (Kick) Kennedy and her friends, colleague, romances and search for meaning. Kick falls in love with England where she strives to find a worthwhile life while also enjoying a busy social life with her friends, including Deborah Mitford and her circle. Kick is always aware of what is expected of her as a Kennedy but struggles with this. Nowadays when marriages are not universally expected to take place between people who are the same (the same race, religion, socioeconomic status, etc. ), it is hard to recall that this was not always the case. However, when Kathleen (Kick) Kennedy, of Irish background and Catholic, falls in love with Billy, an aristocratic British, Protestant, her parents clearly do not approve. How Kick chooses to live her life forms the core of the novel. I do not want to put in any spoilers so will stop here. I found The Kennedy Debutante to be an excellent historical novel. I hope that you will too! This a wonderful review, Joyce! I loved this book, too. Kick was an enchanting main character.